Please understand that I really wanted to like Pirates of the Caribbean: On Stranger Tides, the fourth film in the insanely successful Pirates of the Caribbean franchise. Unfortunately, director Rob Marshall makes that prospect very, very difficult. That's not fair. Marshall did not intentionally, aggressively make a bad movie. It's just that he might be incapable of directing a good one. Whatever the case, he's the wrong guy to make a Pirates of the Caribbean movie, and On Stranger Tides suffers as a result. I'm a big fan of the Pirates series. Saying you like the original, Curse of the Black Pearl, is hardly a controversial statement -- everybody likes that one, and it's one of the few movies of the 2000s to achieve widespread "new classic" status. When talking about the sequels, however, things get a bit trickier. Though both were massive box office hits, it's hard to find someone who actually likes Dead Man's Chest and At World's End; mostly, they're written off as bloated and indulgent and confusing and nonsensical. And while much of that is very much true, I am the someone who likes the sequels. Really likes them. I think there are a number of comparisons to be made between the first three Pirates films and the original Star Wars trilogy -- and I mean that as a compliment to Pirates, not as a knock on Star Wars. But while On Stranger Tides is still a part of the series, it doesn't have a whole lot in common with those first three films. The major difference is the change in director; gone is Gore Verbinski, who, it turns out, was the best thing about the original films. In his place is Rob "Step, Turn, Three, Four" Marshall, who got lots of attention for directing Chicago before making Memoirs of a Geisha and Nine just to prove everyone wrong for thinking he was some new talent. The other major obstacle in On Stranger Tides is the screenplay, which is once again from Ted Elliot and Terry Rossio (who have written every film in the series) and is filled with thinly-sketched characters and some truly clunky exposition. The movie could really be divided right in two: in the first half, the characters explain their backstories and talk about the things they want and in the second half they actually start doing stuff to achieve their goals. That means the first hour of the film is almost totally useless. 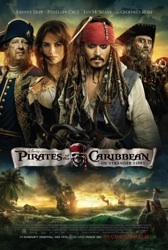 It sets up some of the characters and gives us a small amount of enjoyable Jack Sparrow business (an escape from the King's chamber recalls some of the best "genius or lucky" moments from the original series), but devotes itself mostly to terrible expository dialogue scenes, interrupted every few minutes by hollow swordplay or chase sequences. These action beats have nothing to do with the story or the characters and everything to do with providing some perfunctory "excitement" designed to please the summer movie crowd, ignoring the fact that without any motivation to ground it all the scenes are just business and noise. It's not until the cast actually sets off on their quest to find the Fountain of Youth (the motives for which are dubious at best on the part of pretty much every character) that the movie begins to take shape and come alive. It's at this point that Marshall finally begins to embrace the weirdness of Verbinski's series, whether it's a bunch of toothy mermaids or Blackbeard's ship, which comes alive when controlled by the pirate's sword. Even then, though, it never really feels like Marshall is comfortable with the supernatural side of the Pirates world. Verbinski drew criticism for overstuffing his frames, but you got the feeling that he was so at home with the weirdness that he wanted to pack in as much as possible (besides, how can we be upset about a billion dollar franchise that owes so much to the work of Terry Gilliam?). The supernatural elements in On Stranger Tides seem there because the audience has come to expect it, not because Marshall (or the movie, for that matter) has an interest in any of it. All this creates the feeling that too much of On Stranger Tides feels like an approximation of what came before it, but without any understanding of the soul of those movies. Even the look of the movie feels false a lot of the time; while Verbinski succeeded in creating his own universe, a good deal of On Stranger Tides feels like the work of set decorators and costume designers. The problem with Johnny Depp this time around isn't that he's taken center stage (as so many critics have claimed); it's that he no longer has a character to play. Any trace elements of Jack Sparrow that exist in On Stranger Tides are there because Depp has grafted them on to an otherwise textbook dull hero character. What made Sparrow so much fun in the original series is that we never quite knew where he was at -- he appeared a drunken fool, but was always working every possible angle and never revealing until the last possible second what his master plan had been all along. He surprised us. Not only does Sparrow not appear to be scheming or outthinking the other characters in On Stranger Tides, but I have no idea what it is he even wants. In Curse of the Black Pearl, he wanted revenge and he wanted his ship back. In both Dead Man's Chest and At World's End, he was ruled by fear -- time was running short on the debt he owed to Davy Jones and his Kraken, and Sparrow was acting purely out of self-preservation. In On Stranger Tides, he has no motivation for doing the things that he does other than that is required of him to move the story forward. He's inconsistent as a character, but not by design (as he was in the original series). He acts according to the necessities of whatever scene he's in at the moment, and without even him as a ballast (see what I did there?) the movie starts to fall apart from the center outward. He doesn't get a lot of help from the supporting cast, either. Gone is Verbinski's deep bench of colorful actors and memorable characters, and in their place is a generic group of pirate extras (plus one bland Orlando Bloom type playing a religious man who falls in love with a mermaid). Penelope Cruz, as Blackbeard's daughter/Sparrow's one-time love interest, does her best and is maybe the only character in the movie with a consistent motivation, but that doesn't make her all that interesting. She's great to look at and appropriately passionate, but because the rest of the movie is so disconnected, it's hard to understand what she's getting so worked up about. Geoffrey Rush's return as Barbossa (minus a leg) is always welcome, but his arc makes little sense because it's only ever sketched out in broad strokes of dialogue. Marshall's Pirates is all tell and no show, and nowhere is that more apparent than with the character of Barbossa. Then there's Ian McShane's Blackbeard, which, on paper, sounds like absolutely inspired casting. Sadly, he's easily the weakest of any of the Pirates villains to date. Again, we barely know what it is he wants -- to get to the Fountain of Youth, obviously, but for reasons that are only mentioned in passing. There's talk of a 'prophecy,' but it never feels like something real hanging over the character and driving his actions. It feels like lines of dialogue in a screenplay. We're told time and again that he's vicious and menacing, but never really get to see that (again, all tell and no show). Like Sparrow this time out, the only stuff that works with Blackbeard is what McShane brings to it, because the script isn't interested in anything about the character beyond the name. In the end, On Stranger Tides isn't a terrible movie, but it is a mess -- and not a mess in a fun or interesting way like Dead Man's Chest and At World's End. Any enjoyment I got out of it I really had to work for, and was likely only possible because I really am a fan of the series. If Disney sees fit to make a fifth film -- and there's really every indication that they will -- let's hope Marshall isn't involved. Allow me to nominate Alfonso Cuaron or Guillermo del Toro to direct the next installment. I know they won't do it, but wouldn't that be something? Great perspective -- I love the idea of del Toro directing the next Pirates! I was also really intrigued by what you term the "lucky or genius" factor in Sparrow's character. That's such a compelling combination, always entertaining and relatable. I think F This Movie! has just identified a "new" (or at least under-appreciated) character archetype with "lucky or genius"... for starters, I'm going to add Doc Brown to the list. Am I off base, or onto something? Thanks! I'm all for compiling a list of "lucky or genius" characters. A lot of movie cops and detectives probably fall under this category, especially in comedies.